Blizzard has dropped a new teaser revealing more about the next Overwatch Archives event, dubbed Storm Rising and set to run April 16 to May 6. The audio file posted on Twitter discusses pursuing big-knuckles bad guy Doomfist through his accountant, Maximilian, using a strike team led by Tracer, with Mercy, Winston, and Genji backing her up. There's apparently some reluctance to throw the team back into action "after what happened with Reinhardt," but Tracer's come a long way since that King's Row business, and "they'll get it done." The whole thing has a certain Untouchables ring to it at this early stage, with a small squad of dedicated crimefighters working to take down a criminal powerhouse through his chief financial flunky. I imagine there'll be quite a bit more gunfire, though, and Tracer-as-Kevin-Costner could go to some really interesting places. We'll keep you posted. Overwatch might be taking a trip to Havana in the near future, judging by a teaser that popped up over the weekend. It's a fictional report from the Havana Sun, spinning a story of a treasured local rum distillery, Don Rumbotico, swallowed up by a shady, anonymous financial group. Don Rumbotico, the face of which is a moustachioed robot, has been a staple of the Cuban capital for centuries, but more recently it's become a global brand, the report tells us. Originally a family-run business, a financial group attempted to acquire it, and when they failed, barrels of rum started vanishing and then the distillery burned down. The family had to sell. A picture of the distillery appears in the article, suggesting we'll be visiting it—and fighting inside it—ourselves at some point. The article also mentions the Havana Sea Fort, another landmark that's been snatched up by this suspicious group. "Now, security guards patrol its grounds and unfamiliar helicopters traffic through its airspace," We're told. "While its doors remain closed to the public for the foreseeable future." Another story in the paper warns of an impending hurricane threatening Cuba. Expect 193 kmh and flooding, it says. We don't normally have to worry about the weather in Overwatch maps, but it could be that Blizzard is trying something new. It could also just be cosmetic. The sky above the distillery in the screenshot is overcast, and it's raining. Bring a brolly. It's coming up to the time of year when we normally get an Archives event, digging into a bit of Overwatch's history with a temporary PvE challenge. 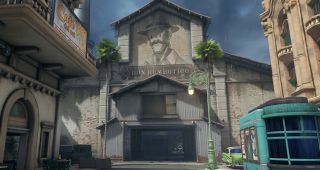 While the first Archieves event, Uprising, gave us a reskin of King's Row, last year's introduced Rialto, which became a regular map after the event ended. The same thing could happen this year, though it's not yet clear how the distillery and fort tie into the organisation's past. Expect Blizzard to spill more details soon.